Michael Kors stock is up big over the last few months thanks to a better-than-expected earnings report in August. However, one analyst still sees more than 40% upside. 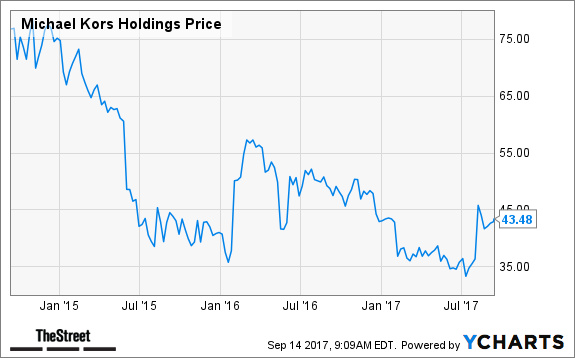 What should investors make of Michael Kors (KORS stock? In July, Kors stock was trading for $32. Now it's trading for $42 thanks to a massive rally in August after the company reported earnings. Beating on earnings per share and revenue estimates, and providing better-than-expected guidance for next quarter and the full year has given investors confidence. So with shares already up more than 30% from those lows, should investors be chasing the stock? KORS is a double-edged sword on a number of levels. First, its comparable-store sales came in at an underwhelming -5.9% for the most recent quarter. However, that's better than the 9% drop analysts were looking for. That's good (right?). Further, despite being profitable and having a low valuation, with a P/E ratio of just 13, we know Kors is cheap for a reason. However, that's not stopping Jefferies analyst Randal Konik from getting behind the stock -- and that may be an understatement. After attending the KORS Collection show, Konik says Michael Kors has a strong brand with a solid global reach. It also has a large addressable market. Despite the dominance of e-commerce and Amazon.com, Inc. (AMZN - Get Report) , it won't replace brands, he says. That's why he says there's just 10% downside in KORS stock and a whopping 43% upside to current prices. He assigned a $60 price target to go along with his buy rating. Konik also pointed out how Coach (COH trades at a premium compared to Kors. This flies directly in the face of Bernstein analyst Jamie Merriman. The analyst assigned a $37 price target and underperform rating on Michael Kors just the other day.